One of the most common questions that we receive in our Community is what alternatives exist out there for small businesses that don’t want to use QuickBooks anymore. In fact, we even put together a list of QuickBooks alternatives for easy reference since so many people ask us that question. Seeing this plea for other software solutions so many times, we wondered why users seem to hate QuickBooks so much. Given the fact that it’s one of the biggest accounting solutions on the market, why are so many users so dissatisfied with it? What Do QuickBooks Users Have to Say? To answer that question, I looked for opinions online to find out what it is about this software giant that has so many of our visitors asking, “What’s a good alternative to QuickBooks?” Of course, part of that answer almost always has to do with the fact that one solution cannot be everything to everyone; but there does seem to be a disconnect between what small business owners want out of an accounting solution and what Intuit is delivering with QuickBooks. And more than anything, I hate QuickBooks. Shouldn’t be so negative, but it needs to be said. Not cycling related, but I’m looking forward to the day when I no longer want to strangle someone at Intuit over QuickBooks 2013. Is there an alternative to QuickBooks? You know, one that’s intuitive and not awful. There’s no question that QuickBooks is an extremely robust and feature rich accounting solution, but that doesn’t make it an easy-to-use solution–quite the opposite, in fact. Although accountants seem to have very little issue with QuickBooks, business owners are frustrated and fed-up with the software. If you search for “QuickBooks” on Twitter, you’re just as likely to see frustrated user tweets as CPAs advertising the fact that they offer consulting services centered around QuickBooks, a testament to the fact that there’s so many people floundering with the system that a thriving business in QuickBooks consulting has emerged over the years. Is QuickBooks Really for Small Businesses? So even though an accountant might be able to navigate QuickBooks with relative ease, a small business owner with no accounting background will likely be at a loss when it comes to using QuickBooks. For example, in a small, 10-person company where it’s probably the owner who’s managing bookkeeping tasks, QuickBooks is incredibly difficult to use and navigate because there are things like batch invoicing, forecasting, balance sheets, etc. that people without accounting expertise don’t know how to handle. Not only that, but most small businesses don’t need a fraction of the features that QuickBooks offers, and so using the software becomes a chore that business owners would rather avoid. In fact, Maurin noted that 92% of small businesses in the US are 10-person operations or smaller, which is a staggering number users that QuickBooks is apparently not suited for. In our interview with Branch a few weeks ago, he also mentioned that most small businesses are either trying to do everything themselves with the help of spreadsheets and shoe boxes, or else they avoid doing accounting altogether. That definitely doesn’t sound like the kind of user base that can download QuickBooks to their computers and start plugging away at accounting tasks. Intuit is trying somewhat, though, as evidenced by their announcement a couple weeks ago regarding the release of a new QuickBooks iPad app, but that doesn’t really address the core issue that many small businesses have with QuickBooks–it just wasn’t built for them. Although QuickBooks 2013 came with a major UI overhaul, no doubt meant to rejuvenate the interface and make it seem more up-to-date, most users hated it, as demonstrated by the Amazon reviews of QuickBooks 2013. Should QuickBooks Tout Itself as a “Small Business” Solution? Perhaps the real answer to this question depends upon what kind of “small business” we’re talking about. The software giant is really for mid-sized to large businesses, and that’s where they seem to be focusing their efforts anyway. What small businesses actually need is simple software that does pretty much everything for them, and QuickBooks is not that in the least. 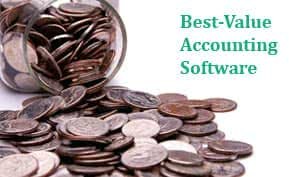 While many businesses out there still don’t depend upon accounting software for their bookkeeping needs, instead using spreadsheets and keeping receipts in shoe boxes, they’ll no doubt end up turning to easy-to-use online accounting solutions instead of bothering with the headache of QuickBooks. The challenge is for accounting software competitors to get the word out to users that there are other solutions besides QuickBooks.